Modern businesses are struggling to control performance while enabling faster and more frequent business change. Our new infographic highlights how the 7 Pillars of Software Performance framework can help you to meet these challenges. Traditional methods of measuring and testing software performance are utterly inadequate, so why are we still measuring and testing like it’s 2008? Now, code changes are made faster and more frequently, which means the risk of something going wrong is greatly increased. The only way to mitigate this risk is with much more comprehensive performance testing, which is why we developed our proprietary framework – the 7 Pillars of Software Performance (7PSP). We’ve created this infographic to help you better understand what the 7PSP are and how they can help your business produce software that is higher quality, better performing and more stable. What are the 7 Pillars of Software Performance? Unlike many competitors, we understand that simply measuring response times and throughput is no longer enough to guarantee a satisfactory end-user experience for your customers. By evaluating your software in this manner we’re able to look at all the available information conference software performance, not just a fraction of it. With a more complete picture of your software, we’re able to create a much more detailed strategy to manage and enhance performance. Why are the 7 Pillars of Software Performance important? Simply put, if you’re not testing your software across all seven pillars, the performance of your products will likely be impacted and end-user experience will suffer. This can lead to loss of revenue, increased costs, and a negative impact on your relationship with your customers. Traditional testing frameworks also tend to overlook many of the likely failure scenarios and instead focus on the few most commonly encountered problems. It’s better to be safe than sorry though, with the business costs of poorly performing software far outweighing that of additional testing. There’s a common misconception that using cloud services means there’s no need to manage infrastructure capacity, costs and performance. Unfortunately, nothing could be further from the truth. The 7PSP framework ensures your organisation has more control over its cloud platform, rather than ending up with something under-optimised, inefficient and costing more than necessary. What Does the Infographic Contain? 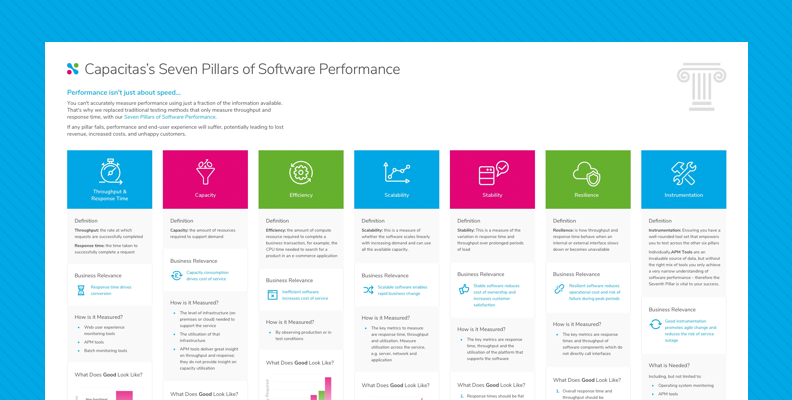 Click here to view the infographic and discover how the 7 Pillars of Software Performance can help you create software that is higher quality, better performing and more stable. For more information on what performance testing can do for your business, download our Performance Testing Primer today.